Welcome to the third and final trimester of your pregnancy! During the next few weeks, your little one will be preparing to enter the world; he will continue developing at an amazing rate. This week's highlight is the opening of your baby's eyes. By week 28, your baby weighs about 2.2 pounds and measures roughly 14.5 inches long. Although this seems very small, it's important to remember that he/she will gain a significant amount of weight in the last few weeks of your pregnancy. According to the Mayo Clinic, this is the week your little one will open his eyes. If you've been wondering about the color of your baby's eyes, you may be pleased to learn that his/her irises now have the necessary pigment. Most light-skinned babies will be born with blue eyes, while most dark-skinned babies will have brown eyes at birth. However, your baby's final eye color won't be determined until several months after his/her birth. Your baby's odds of surviving outside your body are getting better all the time. The Mayo Clinic says that after 28 weeks, you little one has a 90% chance of surviving if born prematurely. Your uterus is continuing to grow. By week 28, the American Pregnancy Association reports that you should be able to feel the top of your uterus about 3.5 inches above your navel. At this point in your pregnancy, you have probably gained between 17 and 24 pounds. Although you may have already been experiencing insomnia related to restless legs syndrome and increased pressure on your bladder, the third trimester brings additional sleep challenges. Many women find that as they get larger, it becomes more difficult to find a comfortable sleeping position. Products like sleep positioning pillows can help, as can getting up for a while and moving around. Eat plenty of fiber and drink water to avoid constipation. Avoid prolonged periods of sitting or standing in the same position. Get exercise to keep the blood moving. Place baking soda or witch hazel on the affected area. Always talk to your doctor about any concerns you may have, including hemorrhoids. Do not take any kind of medication for your hemorrhoids without consulting your medical provider. Now that you've entered the third trimester, your healthcare provider will probably increase the frequency of your prenatal visits. If your pregnancy is free of complications, you may have biweekly appointments until week 36 and weekly appointments from week 37 until your baby is born. 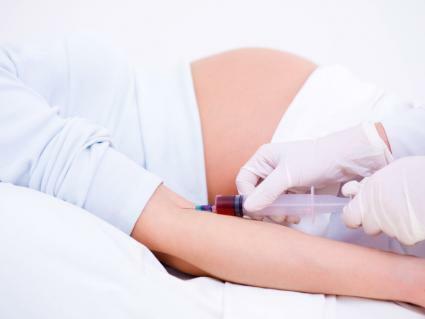 Earlier in your pregnancy, your healthcare provider performed a simple blood test to check your blood type. There are four major blood types: A, B, AB, and O. On the surface of the red blood cells there is also a protein known as the Rh factor. If your blood has the Rh factor, then you are Rh-positive. If your blood does not have the Rh factor, then you are Rh-negative. According to KidsHealth.org, 85% of people are Rh-positive. While the Rh factor does not influence a person's overall health, it can create problems during pregnancy. If you are Rh-negative and your baby's father is Rh-positive, your baby may be Rh-positive. Many Rh-negative women develop antibodies to an Rh-positive baby. This can cause your body to respond as if it were allergic to your baby. If this happens, your antibodies may enter the placenta, attack your baby's blood, and produce anemia. To prevent problems, your healthcare provider will recommend an injection of Rh immunoglobulin at about 28 weeks. This is a blood product designed to prevent sensitization of an Rh-negative mother and keep your baby safe. This treatment is only good for your current pregnancy. If you decide to have additional children, you may need a repeat dose of the Rh immunoglobulin. Now that you're in the third trimester, both you and your baby will be adding pounds and preparing for the big delivery day. Keep taking great care of yourself and your little one; you'll be holding that baby in your arms in about three months.